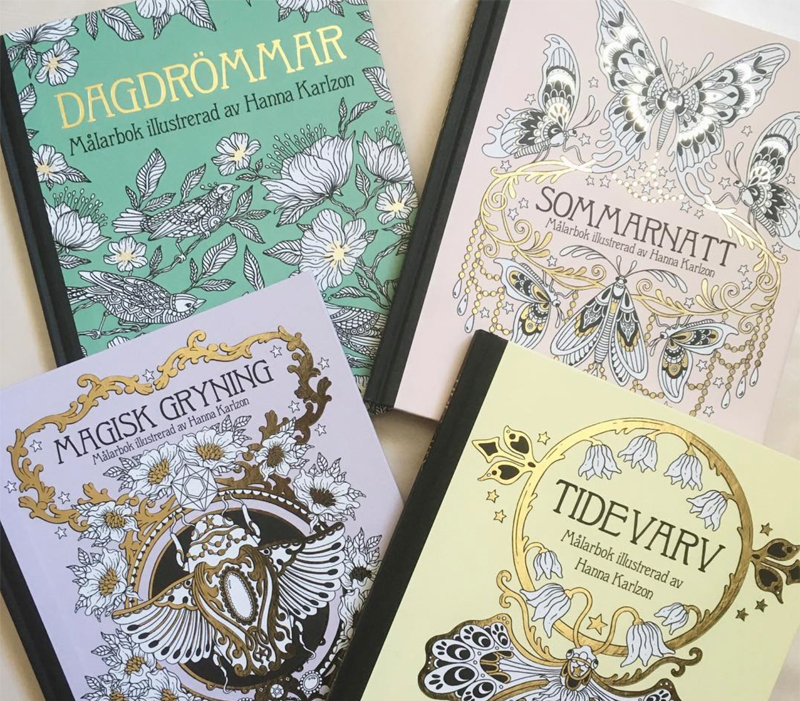 Today (2018-03-23) we launched our collaboration with the Swedish illustrator Hanna Karlzon. Hanna lives in Umeå in the north of Sweden and started her own company as an illustrator and graphic designer in 2013. 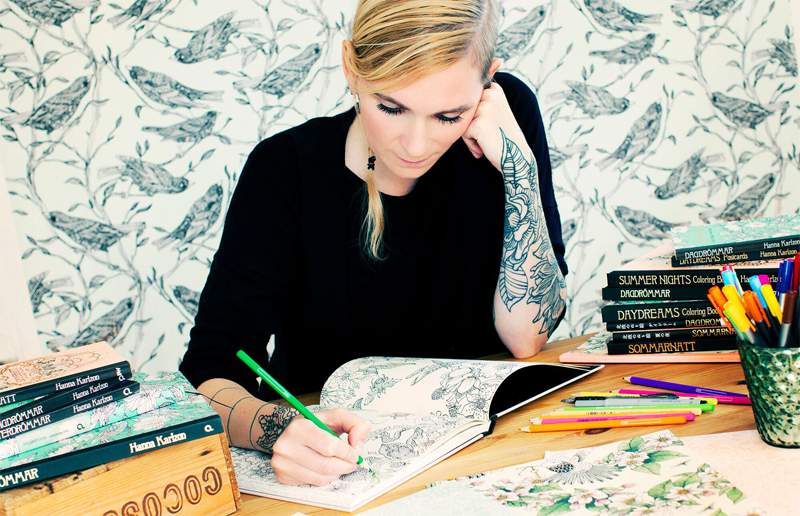 She's probably most known for her dreamy illustrated coloring books for adults. We were curios about her life and business and decided to ask her a couple of questions. Hi Hanna and welcome to The Folklore Company! We're so glad you're joining us! Thank you! Yes, my name is Hanna Karlzon. With pen and paper I illustrate detailed drawings, preferably of people, jewelry, animals and flowers, often with a dreamy feel to it. I get my inspiration from earlier historic times/people and I'm a huge fan of the 16th century. The turn of the 18th and 19th century is also one of my favorites as well as even further back in time like the Viking age, but also from the 70s and 80s punk rock. 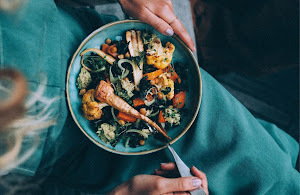 I mix all of this with the animal- and nature life found locally here in (the Swedish) Västerbotten and the end result is a lovely mixture of a little bit of everything, just the way I like it. It took some time to get this collaboration going, we started talking about it in the summer of 2016 and now is the first time you got some time over. You've had a couple of intense years, tell us about what you've done! The last 3-4 years I've been working with illustrating coloring books. I've released 4 large (100 pages) books as well as a couple of post card collections, mural books and some other stuff. My fifth coloring book is released April this year. The books turned out very popular and have been translated in 11 languages. So yeah, all of my time the past years have been dedicated to producing them but now I have some extra time over for other fun projects, like this one! Apart from your lovely coloring books you've done a lot of other illustration projects. What do you think people love the most about your illustration style? Well, that's a good question and I'm not sure I can answer it. I try to avoid analyzing exactly what people like and just stick to my thing. I've noticed that that is works the best. If I start to focus too much on what other people want I get lost in that and tend to lose my own style. What's happening in your company right now, any new books coming up? As I mentioned earlier I'm releasing a new coloring book, "Smyckeskrinet", in the middle of April which I'm very much looking forward to. Apart from that I have a couple of ideas but nothing that's official yet. 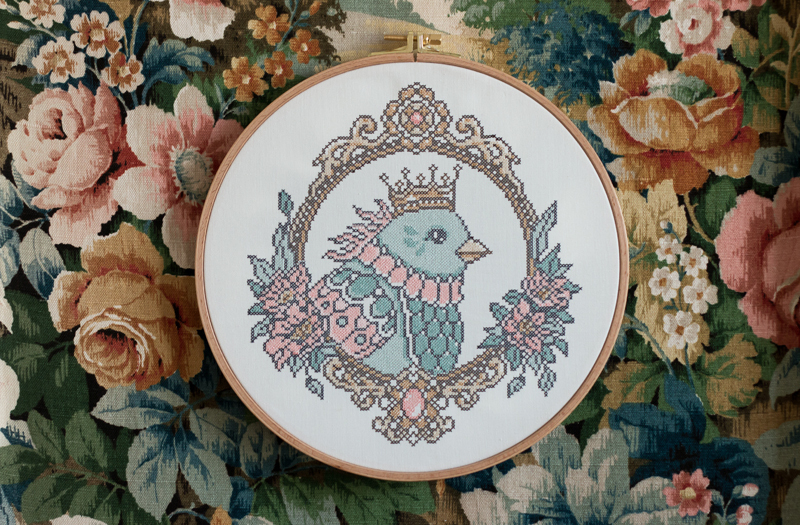 When it comes to handicraft, specifically embroidery, what's your experience with that? 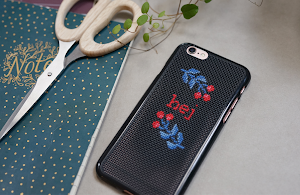 It's been long since I embroidered something myself but I've thought about it for a while, that I want to create something soon. 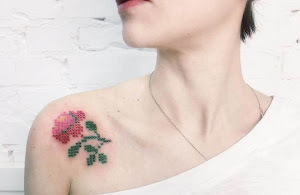 My grandma was an incredible stitcher and my mother is also really talented at handicraft (as a lot of women from earlier generations tend to be) but personally I feel like I've lost the connection to textile work and I'd love to find it again. With that said I work hard with my own hands, when I illustrate I use pen and paper (not the computer) and I enjoy classes in various types of craft. Lately I've been learning how to forge things with silver and up next is birch-bark craft. I love the feeling and the thought of creating with my hands, something that lasts, something important, something that takes time and has value, as an opposite to the wear and tear mentality in todays society (and in my own head to be honest). When I approached you asking for a collaboration you were instantly interested, which is incredibly fun. How come? Simply because I think textile work/craft/handicraft is fun and something more people should try and fall in love with. Everything is so digital today and a lot of time is spent with our phones and computers and I don't think I'm the only one who thinks it can feel a bit tiresome and stressful. I feel, more and more, that I want to press pause on all the digital stuff. 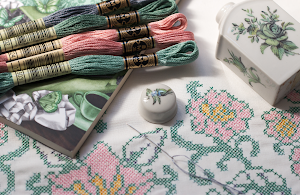 Take a step back and rediscover various crafts that was such a natural part of live for the earlier generations. With that in mind The Folklore Company was the perfect match for a collaboration because I think you work as a great link between old handicraft and the modern human. Last but not least. We know you have an upcoming Folklore-order. What magical words will you put on your wall? 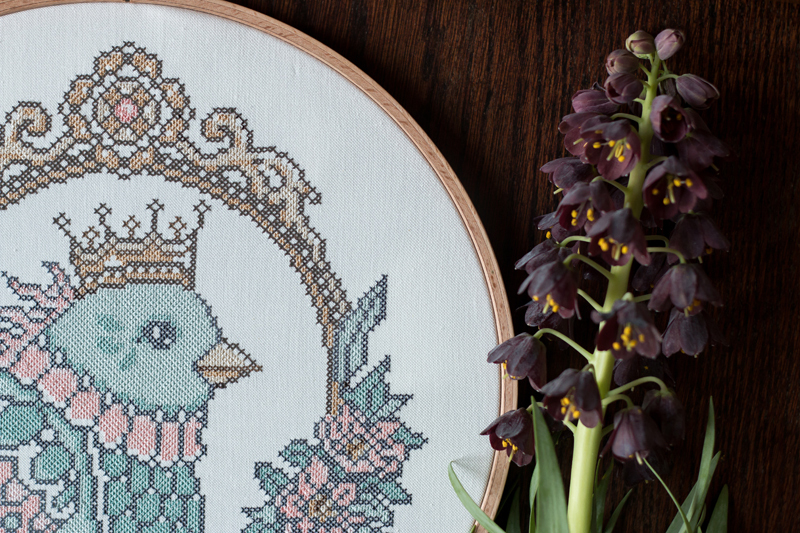 Thank you so much Hanna and we hope you all will like the pattern we've created together! You can find it HERE.